Law Firms have what is perceived as one of the most complex billing/invoicing processes in comparison with other industries, and this results in high levels of manual effort throughout the lifecycle of a bill, costing the firm hard dollars in resources as well as lost opportunities for billable/chargeable fee earner time that is spent on reviewing poor quality bills. Fulcrum’s World Class billing and process optimization services operate well above industry benchmarks for efficiencies and accuracy in core financial and billing processes— processing hundreds of millions of dollars in legal invoices. Leveraging Fulcrum Snap for Legal, industry best practices and business processes are built in allowing Fulcrum’s VOD team to deliver high quality, cost-effective, repeatable and reliable processes for your firm. Fulcrum Snap for Legal Enterprise Cloud Edition end-to-end cloud practice management system has almost 10,000 industry best practice requirements and patented business processes built in—which means it will meet over 90% of most firm’s requirements right out of the box. 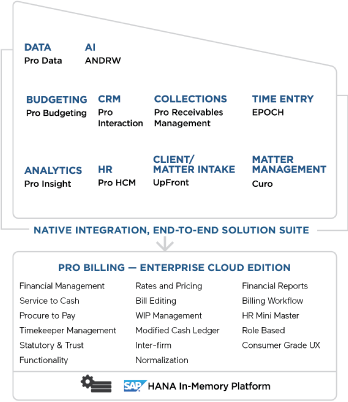 Snap covers nearly all aspects of a law firm’s operations from Time Entry, Client/New Business Intake, and Matter Pricing/Management, to Billing and Finance, Collections, Analytics and Reporting, HR/Human Capital Management, and Financial Document Management. Billing services with built-in workflow to help manage WIP, generate draft bills, make revisions at the direction of your firm and generate final invoices. Our experts are highly skilled and proficient in SAP, market leading eBilling platforms and more, to deliver efficiencies to your billing practices. Using Fulcrum’s Snap Collections solution, the VOD solution manages A/R processes from handling disputes, creating and following up on promises to pay, and more to increase your firm’s payment realization. VOD follows GAAP, IFRS, and other applicable accounting standards and ensures that the results delivered to your business are accurate and meet the required timeline on a cash, accrual, and modified cash basis. VOD is positioned to provided support from G/L postings and reconciliations, fixed assets and intercompany accounting, to general accounting and bank management.